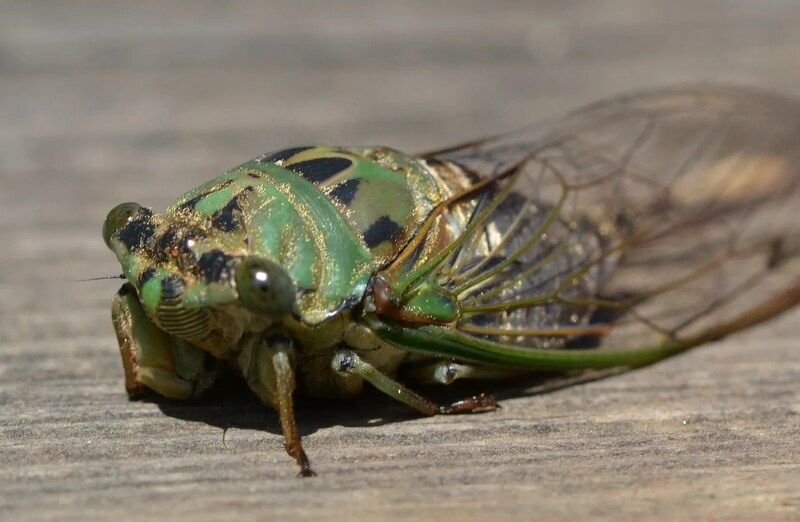 Ok, so you might recall that two days ago I posted a picture of a cicada with the promise of a future post giving the story behind it. 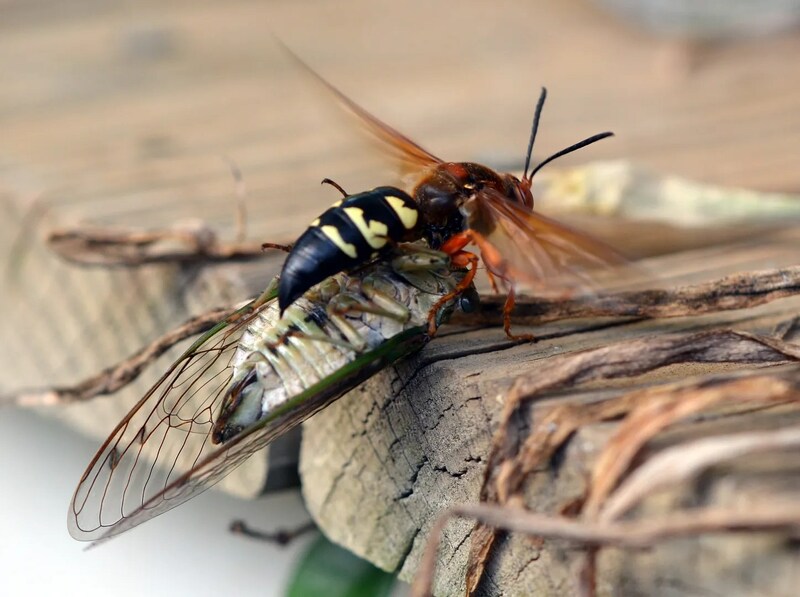 As their name implies, Cicada Killers have one source of livelihood and sustenance, the homely Cicada. 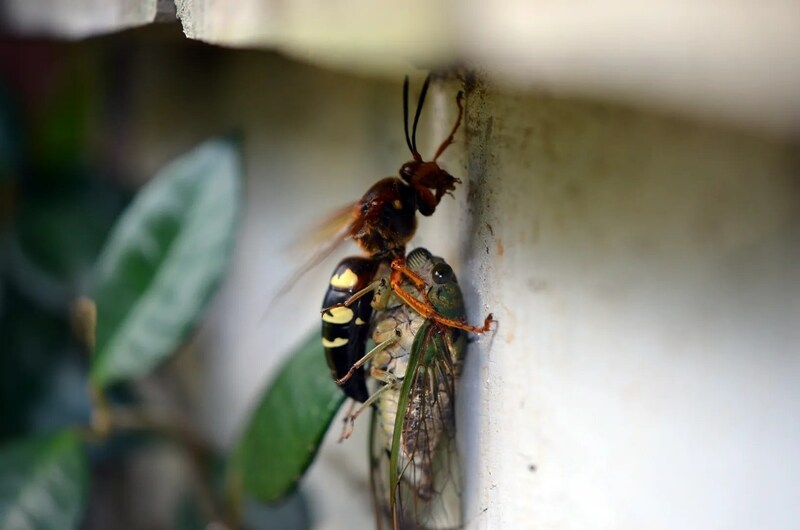 As the cicadas emerge each season, so do the Cicada Killers. 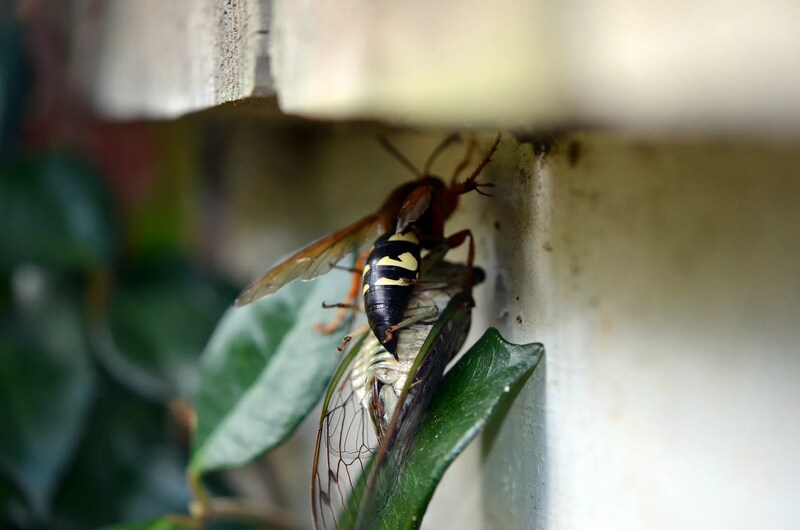 Once their burrows are started and they have gone through their mating rituals, the large female “CKs” spend the balance of their relatively short existence hunting and retrieving Cicadas. 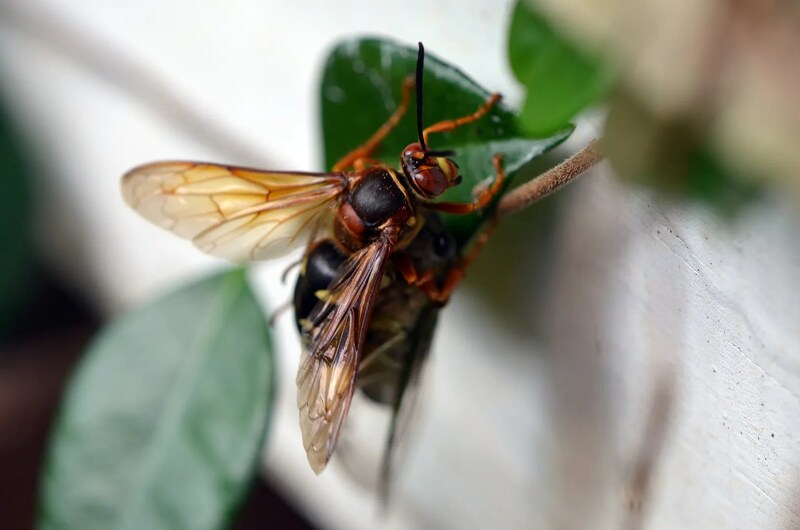 The wasp’s sting isn’t a strong one; it is just sufficient to paralyze (but not finish off) a Cicada. 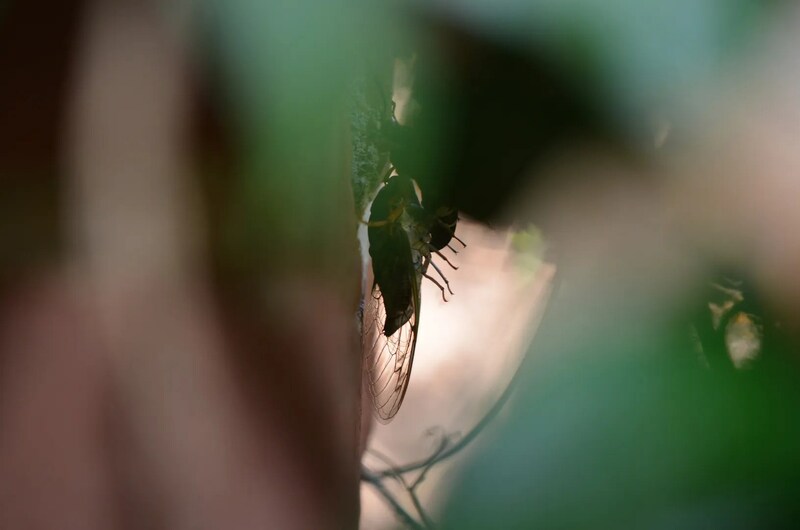 Once incapacitated, the Cicadas are hauled back to the burrow and sealed in a chamber with a single egg. 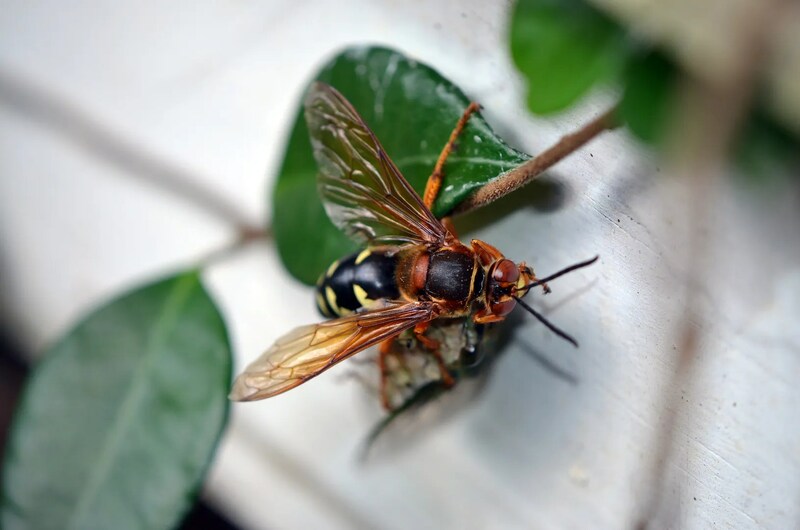 You can guess the rest (think “Invasion of the Body snatchers” or “Alien”); of course the egg hatches and by June of the next year a new wasp emerges. 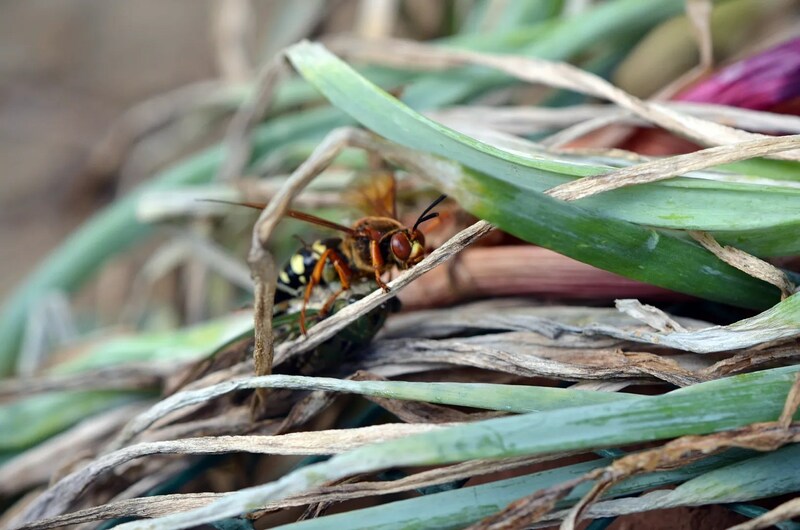 However, the relative size of predator vs prey sometimes creates a logistical issue for the wasps. 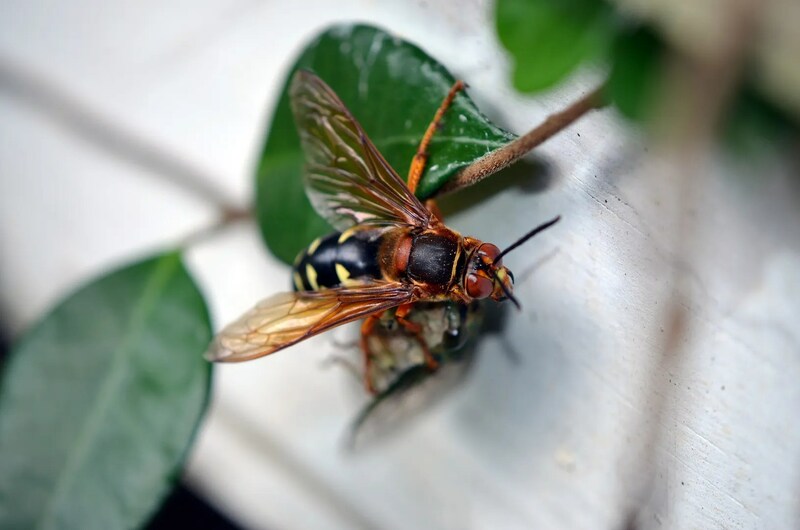 Even through these are among the largest wasps in North America, they can still be significantly undersized compared to the average cicada and tend to lose altitude quickly when burdened with their oversized payloads. They fly like an overloaded aircraft that has lost all but one weak engine; occasionally I catch one in its lumbering approach flight, wobbling inbound with trajectory that should have an accompanying and panicked “Mayday! Mayday! We are going down!” radio call with it. If the return flight falls short, the CK isn’t done; she definitely doesn’t give up. 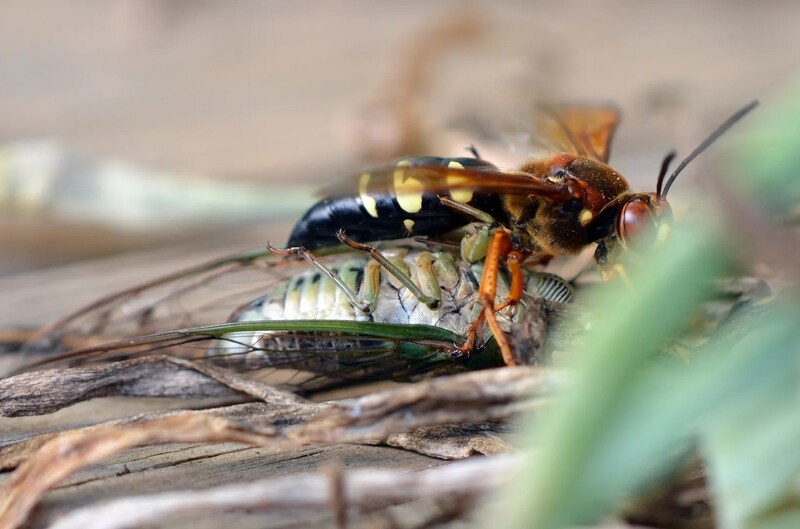 However, over most terrain, they can’t efficiently drag their prey (more of a “buzz wings and barely ski on the ground” with the Cicada); they must find something to climb and from this higher point their homeward bound flight is re-launched. I continued to track her and photographed as she made it up to the surface of the porch and launched again to the next highest point. Note that in this last picture that her wings are beginning to buzz and that she has turned to look my way. Always looking for the next productive step to gain the most altitude possible, she has noticed a considerably taller object within a short hop and in the next instant was on the photographer’s hip. 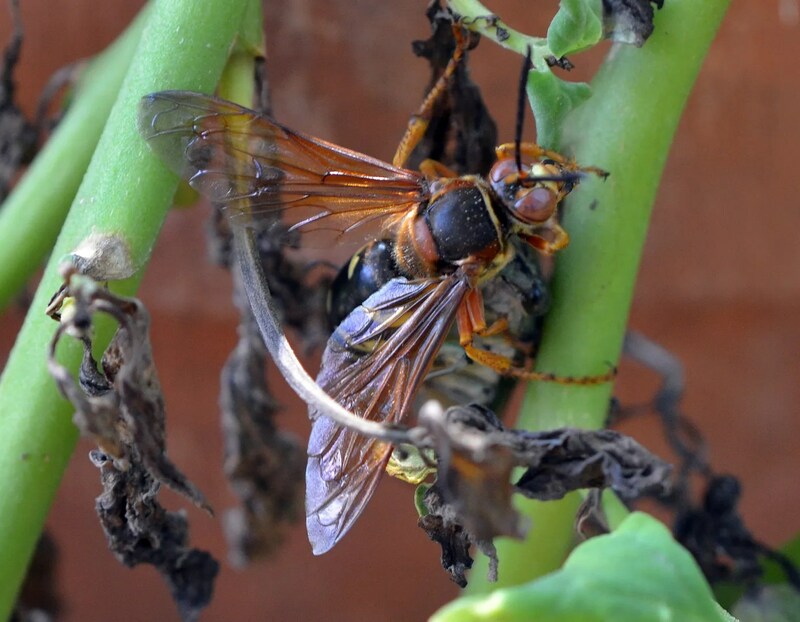 I am aware that Cicada killers do not sting humans and have even played games with them before and gotten them to land on me (what a bored old garden nerd eh?). 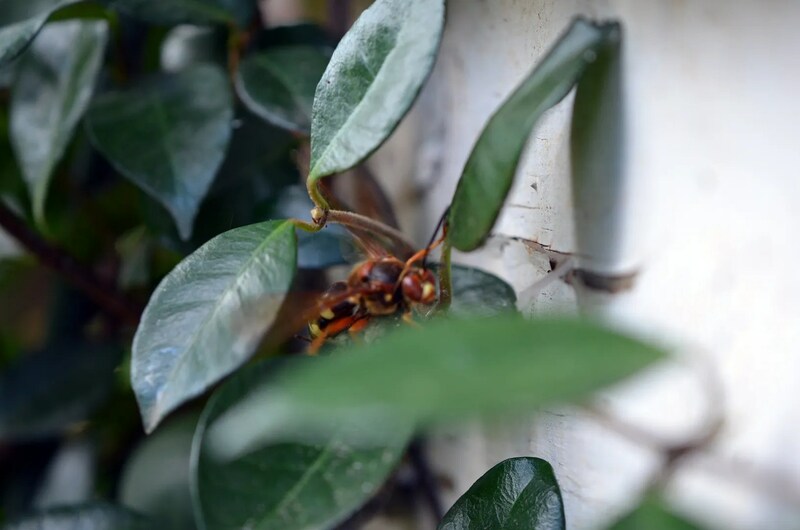 I tried to avoid hyperventilating as she started up my side and attempted to execute a hurried series of photos to prove my stoic dedication to documenting nature’s cycle. However, these pictures turned out similar to what one might expect from a photographer shooting his own mauling by a grizzly; they were a series of indistinguishable blur. In the 10 or 12 seconds it took for her to climb from my hip pocket about halfway up to my collar it dawned on me that she wouldn’t stop until she reached the highest point on my head, which at best meant the traverse of the back or side of my neck, or at worst my face. LOL yes, I get distracted a little by the bugs sometimes. I’ll do better soon, I promise. That was a great story, I got to watch a CK do it’s thing a couple years ago, and was amazed. 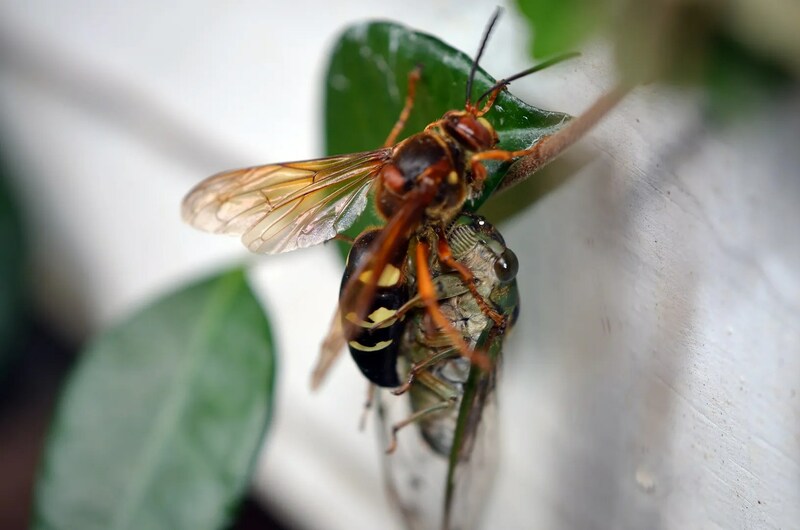 She could only carry the cicada about 4 feet in the air before she would hit the ground. Loved the way you put this together. (photographer taking pictures of their own grizzly mauling had me rolling. LOL). Thanks for sharing this, those pictures are amazing. HAhahahaaaaa! That was a great story, great pics & I especially like the part where she hopped up onto you! Well written & I can just picture it! What a great story! 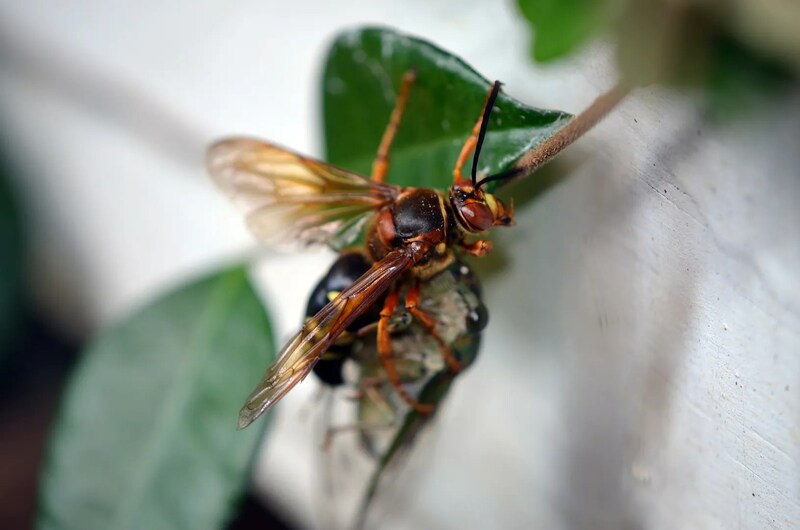 I stumbled on your blog while looking at wasp photos with my son; we’re trying to identify the wasp we have trapped in our window. 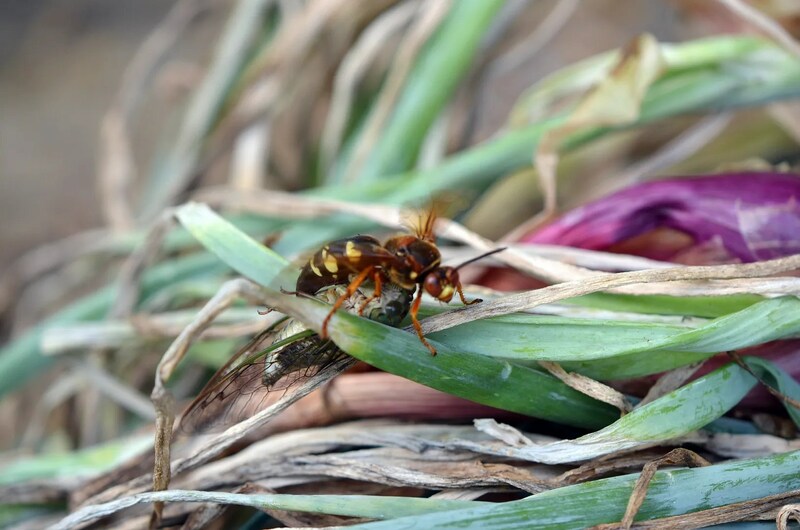 You’re definitely braver than I: when I see a wasp I tend to shriek and run the other way, not let it land on me! 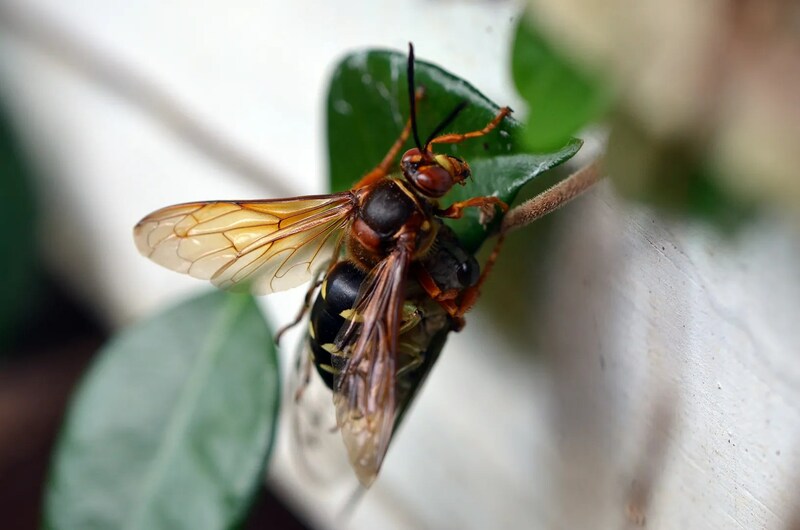 But I’m glad to know the CKs do not sting humans.